It is one of the frequently asked Java questions from beginners which struggles to get the concept behind an interface. The main difference between a class and an interface lies in their usage and capabilities. An interface is the purest form of abstraction available in Java where you just define the API or contract e.g. you define run() method on the Runnable interface without worrying about how something will run, that is left to the implementor which will use a class to define how exactly to run. So an interface gives you method name but how the behavior of that method is come from the class which implements it. That's your general difference between an interface and class in Java and applicable to all object oriented programming language, not just Java. Even though this question is not exactly the difference between abstract class and interface, it's somewhat related to it because an abstract class is nothing but a class with some abstract method. The points I have discussed there, also applicable here in terms of rules of Java programming related to class and interface. Now, let's examine both syntactical and functional difference between a class and interface in Java point by point, this will give you a better idea of both of them. The interface is best suited for defining type because it promotes multiple inheritances in Java. It is even recommended by Joshua Bloch in Effective Java. Since an interface can extend multiple interfaces and a class can implement multiple interfaces, it suddenly becomes more polymorphic. On the other hand, a class is best suited for writing concrete code which does the actual job. Since an interface is completely abstract you cannot create an object of them but a class can be both abstract and concrete hence you can create an object of a concrete class in Java. where Task is a class which implements Runnable interface. A class can only inherit one class but an interface can extend multiple interfaces. Similarly, a class can implement multiple interfaces but an interface cannot extend a class. This might seem confusing to you but Java allow multiple inheritance in form of one interface extending multiple interface but doesn't allow C++ style multiple inheritance where a class can extend multiple classes. Interface adds flexibility in coding. Any code which is written using interface are more adaptable to a change than code written using concrete classes. This is also a popular object oriented design principle, commonly known as "programming for interfaces than implementation". You can see my post 10 object oriented design principles which every Java developer should know to learn more about that. When to use a class and interface in Java? You can see that since we have defined Instrument as interface the print() method can work with Stock, Future, and Option, that's the power of Inheritance and Polymorphism which comes by using interface. 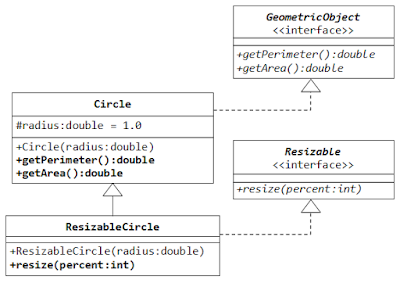 That's all about the difference between a class and interface in Java. The most important difference is to understand when to use a class and interface. As I have previously explained on actual use of interface in Java, it let you write polymorphic code which adds flexibility to your software. This is also known as "programming for interfaces" in the object-oriented world. How to replace an element of ArrayList in Java?